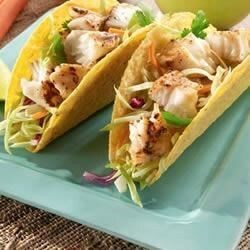 "No need to go to a restaurant for the fresh taste of fish tacos. Making them at home is quick and easy. Enjoy!" Melt Saute Express(R) square in 10-inch nonstick skillet over medium-low heat just until bubbles begin to form. Saute 7-10 minutes or until golden brown on both sides and flaky. Remove from skillet. See how to make 5-star San Diego-style fish tacos. Instead of the saute express mixture, I used lemon infused olive oil and lemon pepper seasoning. It turned out great. Some of the best fish tacos I've tasted. i used olive oil and lemon pepper seasoning. It wasn't terrible but it wasn't mouth watering. Very good. Had to sub olive oil, butter and lemon pepper for the LOL my store didn't carry that variety. These were yummy. this recipie tasted amazing. i could not get enofe of it. Excellent recipe. I used halibut and lemon pepper mix and fried the fish in coconut oil. I then transfer to a pan and finished off in oven for a few minutes. I want to eat these everyday! These are awesome! I did add a little Duck Sauce for a little sweetness! My boys love them! These are delicious!!! My husband says they are definitely restaurant quality! Yummy!!! I used the Baja Taco Sauce with this and it was awesome. Also didn't have the lemon pepper seasoning butter so I made my own, still a re-do in our family.